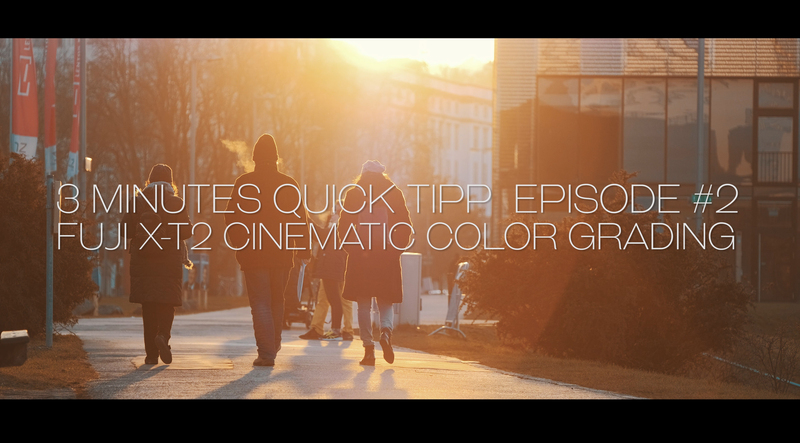 In Episode #2 of “3 minutes quick tip” I want to show you how you can get a cinematic look out of your Fuji X-T2 4k video files. First thing you need is a flat looking profile, the X-T2 has Fuji F-Log, but still only with an external recorder. Nethertheless you can tweak your video settings to get a more flat looking image. color -3, highlight and shadow tone -2, sharpness -3 and very important switch the Fuji filmsimulation to Pro Neg STD, because that’s the most flat looking. You can also save that as a Customn Setting, which you can select quickly via the Q Button anytime. I´m not a color grading scientist, but it tried quite a lot of LUTs on the Fuji material and just with a few tweaks for every scene in your video editing software you can get very nice results. The LUT I used in this video is the free M31 which gives you a nice cinematic look, the main colors in this Lut are blue, cyan, orange. The lenses I used are the excellent Fujinon 50-140 2.8 and the 16mm 1.4 which both work great on a simple slider for cinematic movement. I also made some handheld shots with the 16mm 1.4 and added a bit of post stabilisation, which works great too as you can see in my video.